Look at some pictures to appreciate our b&b! Each bedroom is equipped with private bathroom with windows, wide mirrors, termoarredo (Italian style radiators designed to warm up towels ready to use), hair- dryer, stand-up shower or bath-tub. Cleaning services is provided daily. Clean linings are usually provided approximately every 3 days, depending upon the numbers of days of your stay. 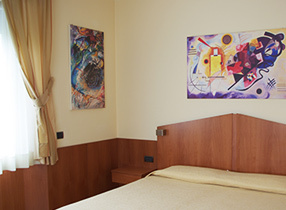 Each room is dedicated to well-known artists and decorated with their most famous paintings. Therefore, you could sleep in the Picasso, Kandinsky or Monet room. Double and triple rooms are available for our guests. We can also add a fourth bed or crib to accommodate your children. • Private bathroom with shower or bath-tub.